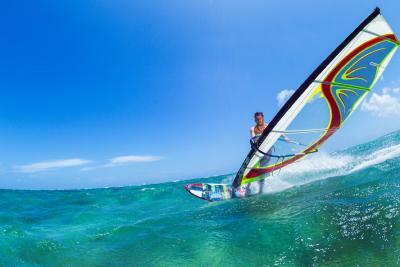 Whether you’re a sailor, windsurfer or canoeist, whatever your passion is, active people need an active sunscreen when enjoying water sports. The RYA has teamed up with Techniblock to offer a discount on the full range of Techniblock sun protection sprays. Techniblock is the perfect protection when you’re on the water. Offering a transparent, highly water and sweat resistant barrier against UVA and UVA rays, Techniblock has real staying power. Quick and easy to apply, this non-greasy aerosol spray dries instantly and protects for several hours with just one application. Dermatologically approved, the modern powerful Techniblock formula provides tough and enduring protection in harsh environments. Oil and fragrance-free, it’s suitable for even the most sensitive skins, particularly those prone to prickly heat rash, and it’s non-sticky application makes it so comfortable to use, it will feel like you’re not wearing sunscreen. Delivered in a sealed, leak-proof can that works upside down, it can even be applied to the scalp! Available in SPF 30, 40 and 50+, as well as a children’s range that is specially formulated to protect young skin, Techniblock’s lightweight formula is unique, providing high, lasting protection with the minimum of fuss. No rubbing in, no stickiness, little trace on the skin and yet it works hard to keep skin protected and nourished. To complete the range, an anti-ageing SPF 50 face crème, a lip balm and an aftersun is also available. Developed in South Africa, this tried and trusted brand has been protecting skin for more than 10 years and is a CANSA Sun Smart Choice product. Say goodbye to thick, gooey creams and lotions that break down in water and need constant topping-up, and try Techniblock for a safe and sunburn-free summer. Name and email address are required. The email address will not be displayed with the comment.